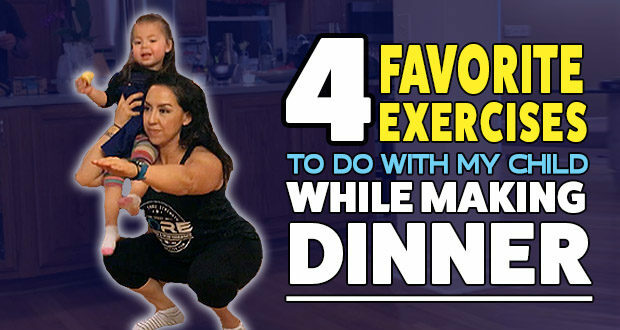 Try these 4 exercises out for size. Do what you can and if you can do more, DO MORE! 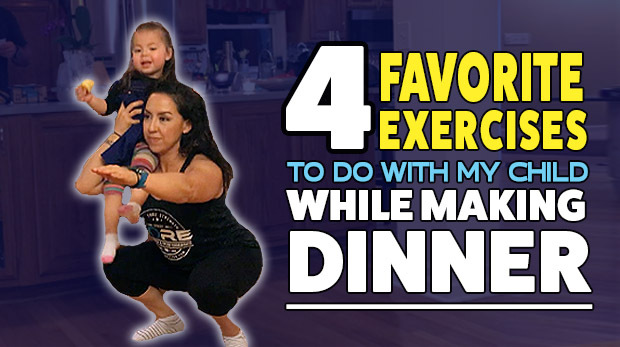 I like to do this 3-4 sets/rounds while making dinner and she loves it! Wide Stance Squat: open legs pretty wide and hold the baby low. Chest up, squat down and squeeze your bum as you come up. Front/Goblet Squat: Feet shoulder width apart and don’t let the heels come up off the ground when you squat. If they do, don’t go as deep. Reverse Sliding Lunges: My fav! Start slowly (or even without the child) to begin. Push down on the floor as you slide your foot back. Squeeze the bum as you raise. Off Set Squat: These are challenging on the core but be sure you can hold your child on your shoulder before trying. You can use your other arm to help balance you (as shown in the video). Have fun with it and be sure to SHARE if you like it!